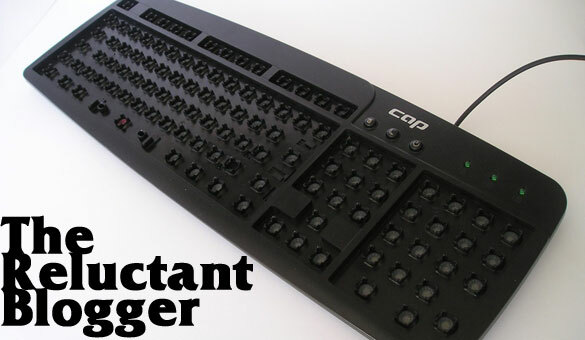 In case you haven’t noticed, I’m not much of a blogger. Truth be told, I hate blogging. I hate the word. I hate the notion. Many years ago, when I was trying to make it as a web designer, blogs were relatively new on the scene and I, in my brilliance, knew they wouldn’t be around long. Their longevity only made me despise them more. So I’ve had this aversion for blogs for quite some time. For a long time, I refused to participate in the blogging craze. I didn’t read blogs. I certainly didn’t write for blogs. I wanted nothing to do with them. I support my friends who blog, and I occasionally read their posts when their titles capture my attention, but I do not follow any blogs religiously. It was recommended I start a blog and after years of refusing, I finally caved. It wasn’t that bad, but I didn’t enjoy it. I still don’t. I never will. And thus, this little insignificant blog has been neglected. Once in a while I think I should get on here and post something, but I don’t want to. In case I failed to mention it, I hate blogging. It’s not like I really enjoy doing dishes or laundry, but those things have to be done. But I’ve made both of those things into therapeutic exercises. It’s a time when I relax, put on an audiobook or some music, and I enjoy my down time. Yes, dishes and laundry are my down time. Perhaps blogging can be similar–a writing “down time.” Maybe if I stop trying to impress the world with my words, not concern myself with the brilliance of what I’m trying to say, stop worrying if it’s relevant, and not even worry about those things like continuity, grammar, and whatever; maybe if I just write and write and write (about whatever), don’t read over what I wrote, and just press publish at the end of it, I’ll find some sort of writerly therapy. The scary thing is that these words are published in a sense, visible for all the world to see (not that the whole world is watching); but what’s more terrifying, putting out words without a second thought? or not having written them at all? I’m sure I’ll give the question much thought the second after I click Publish. YES! 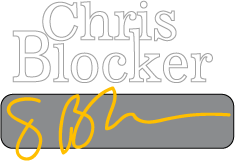 A Chris Blocker Blog! 🙂 I shall enjoy!